If there were the Seven Wonders of the Art World, The Farnese Gallery would certainly be one of them. The work of Annibale Carracci over an eight-year period, from 1597 to 1604, the fresco was painted on the cavernous ceilings of the Palazzo Farnese in Rome, Italy. Before the first brush stroke, Carracci drew hundreds of preparatory sketches, which has pretty revolutionary in its day. Today, many have copied his legendary techniques, which have influenced Italian painting for centuries. “Angels Farnese” focuses on a single cherub in this expansive work. It is part of his “The Love of the Gods”, which occupies the ceiling of the grand salon. Many experts place it in the same category as Michelangelo’s Sistine Chapel in terms of magnificence. This work is a terrific representation of art history in the making. 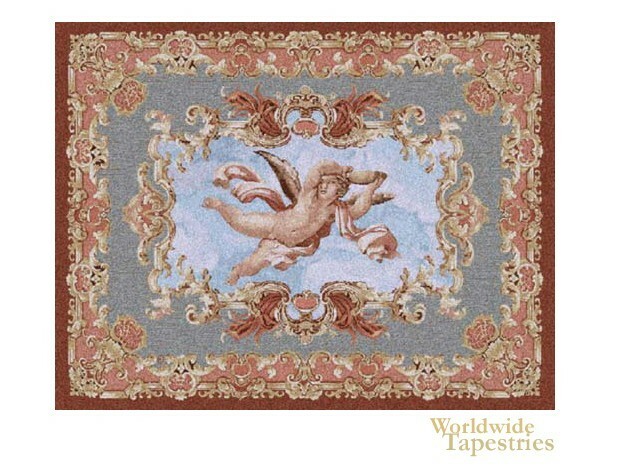 This tapestry “Angels Farnese” is lined and has a tunnel for easy hanging. Dimensions: W 37" x H 28"